After thirty long years, leading global hospitality company Hilton brings back in the Philippines its flagship brand Hilton Hotels & Resorts as it opens the doors of Hilton Manila in Resorts World Manila. Old Manila society surely remembers well the opulence and prestige of The Manila Hilton (now Waterfront Manila Pavillion Hotel & Casino) in Roxas Boulevard. Dominating Manila's skyline, the 22-storied hotel was the highest building and largest hotel in Ermita, Manila during the '60s. With the artworks it held, the decadent cuisine it served, and the warm hospitality it offered, The Manila Hilton was the place to be. Since it bade adieu to the Manila scene in the late 1988, Hilton came back in 2016 after 28 years with Conrad Hotel Manila, one of its 14 world-class brands. Yesterday was another milestone for the near-century old hotel brand as it finally opened the doors of its flagship brand Hilton in a new location, Resorts World Manila--the country's first integrated entertainment and tourism resort--across the Ninoy Aquino International Airport Terminal 3. Hilton Manila offers 357 well-appointed, elegantly styled rooms furnished with the brand's signature features and digital technology innovations. These include the famed Serenity bed; a four-point bathroom comprising a vanity area, toilet, and separate bathtub and rain shower; and the innovative digital key "direct-to-room" technology, which allows guests to use their smartphone or tablet as their room key for seamless access--a feature exclusively available for Hilton Honors members. Hilton Manila is highly accessible from Ninoy Aquino International Airport, with direct connections to Terminal 3 via the “Runway Manila” skybridge. Nestled within the city’s most diversified integrated resort, Hilton Manila is close to key business districts and convention centers as well as museums and attractions such as the Philippine Air Force Aerospace Museum, Villamor Airbase Golf Course, Newport Performing Arts Theatre and Newport Mall. 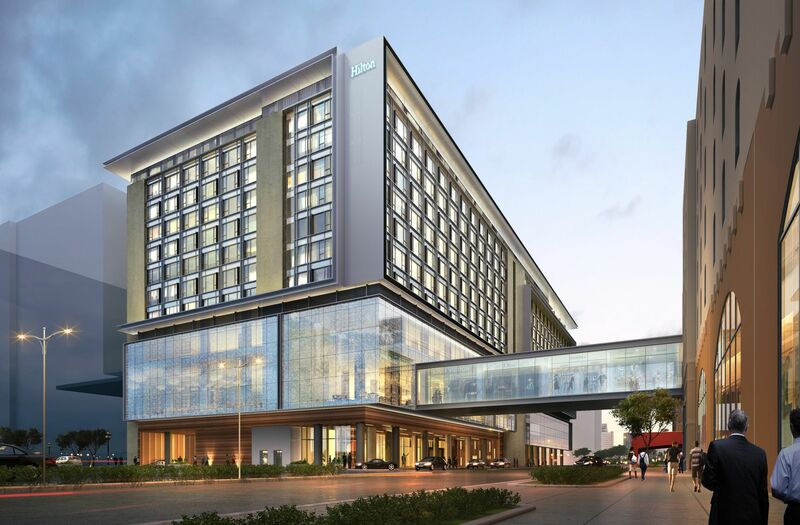 Hilton Manila is also easily connected to the popular Manila Bayside leisure and tourist hub, via the NAIA Expressway and the Makati business center by the Metro Manila Skyway – making it an ideal choice for business and leisure travelers alike. Besides stylish accommodations, Hilton Manila guests can enjoy unparalleled dining options, exceptional amenities and premier MICE facilities. It’s a culinary journey at Hilton Manila with innovative dining offerings at its three restaurants and two bars. Executive chef Dennis Leslie, who has more than 20 years of F&B experience, will bring new and exciting flavors and cuisines to the Philippine dining scene, creating a food and beverage experience that focuses on healthy, nutritious menus utilizing ingredients that are locally sourced, sustainable and organic where possible. The property’s dining outlets include: Madison Lounge & Bar, located at the lobby entrance and reminiscent of New York City’s dining scene. It offers artisanal coffee and a sumptuous grab-and-go selection available during the day and exquisite cocktails, premium wines and bar bites in the evening; Hua Ting, located on the second floor, introduces modern Shanghainese cuisine, using traditional recipes and locally sourced ingredients, in a casual yet upscale setting; Kusina, an all-day dining restaurant that serves Filipino cuisine with a focus on fresh seafood cooked “dampa-style”, classic Filipino recipes with a twist, as well as international staples at its interactive buffet stations; Port Bar, the perfect place to relish pre- or post-dinner drinks, brings in the finest range of craft beers, premium whiskies, cognacs and dark rums from around the world. The bartenders are also known for whipping up creative takes on classic cocktails; Freestyle Pool Bar, where guests can enjoy a light bite and expertly concocted cocktails by the poolside. Guests seeking exercise or relaxation can take a dip at the hotel’s expansive free-form resort-style lagoon pool, relax poolside on sun-loungers or at the swim-up bar, or work up a sweat at the 24-hour fitness center with the latest fitness equipment and free weights. There are also wet and dry play areas for children to enjoy. For stress-free planning and organizing of events, Hilton Manila has six versatile and comprehensive venues to choose from, perfect for business meetings, corporate events and social gatherings, such as weddings, debuts and other milestone celebrations. The meeting spaces comprise multifunctional facilities and a beautiful 545-square-meter ballroom with a 6-meter crystal-encrusted ceiling. The elegant ballroom can accommodate up to 600 people for a reception/cocktail set-up. All venues feature natural daylight and are fully equipped with the latest audiovisual innovations such as smart LED televisions, tech-ready connections for laptops and other video sources, high-definition video conferencing suites and wireless internet. Hilton Manila is part of Hilton Honors, the award-winning guest-loyalty program for Hilton’s 14 distinct hotel brands. Hilton Honors members who book directly through preferred Hilton channels have access to instant benefits, such as an exclusive member discount, free standard Wi-Fi and a flexible payment slider that allows members to choose nearly any combination of points and money to book a stay. Members can also redeem their Points for free nights, and can gain access to unique events through the Hilton Honors auction platform. With the booming tourism of the Philippines, Hilton is optimistic that it will do well in the market, McGrath said, targetting business and leisure travellers as well as the mid-market range. Hutton also said that altough there is a lot of opportunities for Visayas and Mindanao, Hilton would want to venture first in locations they find suitable with their brands. "Over the next year, we look forward to opening our third hotel with Hilton brand in Clark, Pampanga. So in line with constantly working towards our commitment to our guests, perhaps we'd be filling these gaps with our other brands in the right locations," Hutton announced. "We look forward to enhancing the guest experience and playing an integral role in defining the hospitality landscape here in the Philippines."